Essential questions: What do we know about the way that the heart works? 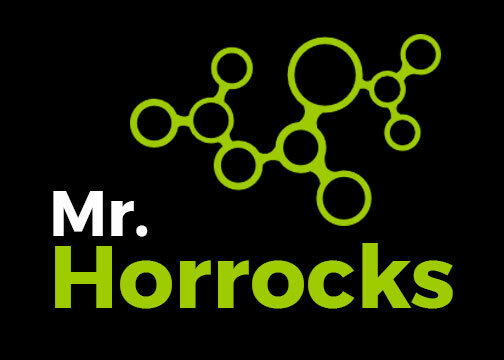 Objectvies: Understand the model for blood circulation proposed by Dr. William Harvey. Artery – a type of blood vessel that carries blood away from the heart. introduction – Read page 290 Overturning ancient theories in science. Be ready to share which part of the story of William Harvey get’s your attention. He guessed the existence of capillaries, without actually seeing them. He conducted numerous experiments on live vounteers using a tourniquet, to prove that blood circulation is unidirectional (one way flow). Conceptual drawing by students: Developed through discussion. Q) A virus penetrates the capillaries found in the alveolar air sacs of the lungs. If the lung makes one complete journey all around the body and back to the lungs, which vessels will it pass through (in order)? Q) In this model, how many times would blood pass through the heart on one complete journey around the body? Q) How would the pressure be different in the arteries, compared to in the veins? Q) What evidence have you seen that William Harvey was correct? 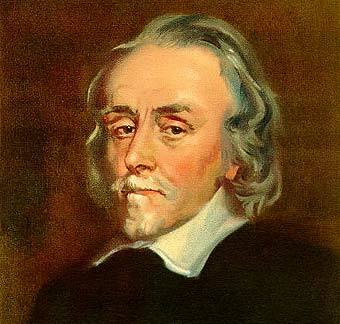 TOK: William Harvey refused to accept doctrines without evidence. Are there academic contexts where it is reasonable to accept doctrines on the basis of authority rather than evidence gathered from primary sources? The double circulatory system is designed to provide two separate circulatory systems, connected via the heart. One goes to the body and back (systemic), the other goes to the lungs and back (pulmonary). -Allows the blood pressure to be increased after oxygenation. -This ensures a rapid delivery of oxygenated blood to all human tissues. -The lung tissues cannot withstand high pressures, and so blood can be pumped separately to the lungs at a lower pressure. This helps to support our relatively active, mammalian lifestyles. An artery is a blood vessel that conveys blood at high pressure from the heart (ventricles), to the tissues in the body. In order to resist this pressure, arterial walls contain elastic tissue made from the protein elastin and a strong layer of smooth muscle. In order to maintain and control this pressure, the elastic tissue recoils after being stretched by a peak volume of blood flow. This recoil helps to propel the blood down the artery. The muscle layer may also contract or relax, to control the diameter in the artery and thereby correct the pressure. 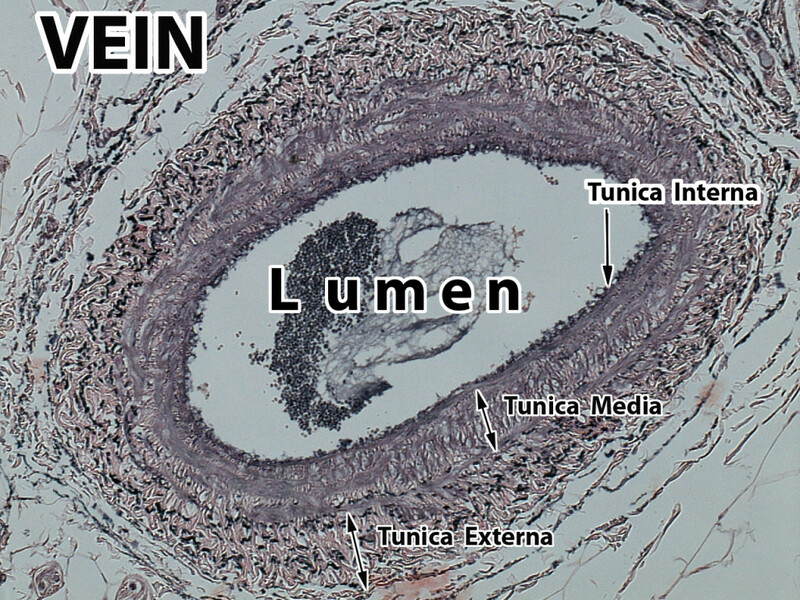 3) Tunica intima: A smooth inner lining (endometrium). A FOCUS ON VEINS (contrasting blood vessels). Veins collect blood at low pressure from the tissue of the body and return it to the atria of the heart. Because the pressure in veins is so low, they do not require a thick muscular layer, or many elastic fibres of the protein elastin. Their walls are therefore, relatively thin compared to arteries. This means that there is more space to hold blood, and veins often have a bigger diameter in the lumen (name for the open space inside where the blood flows). Around 80% of a persons blood is in their veins when they are at rest. In order to help blood move along the veins at low pressure, pocket valves help to prevent back flow. Skeletal muscles also help to squeeze the veins, and keep the blood moving. 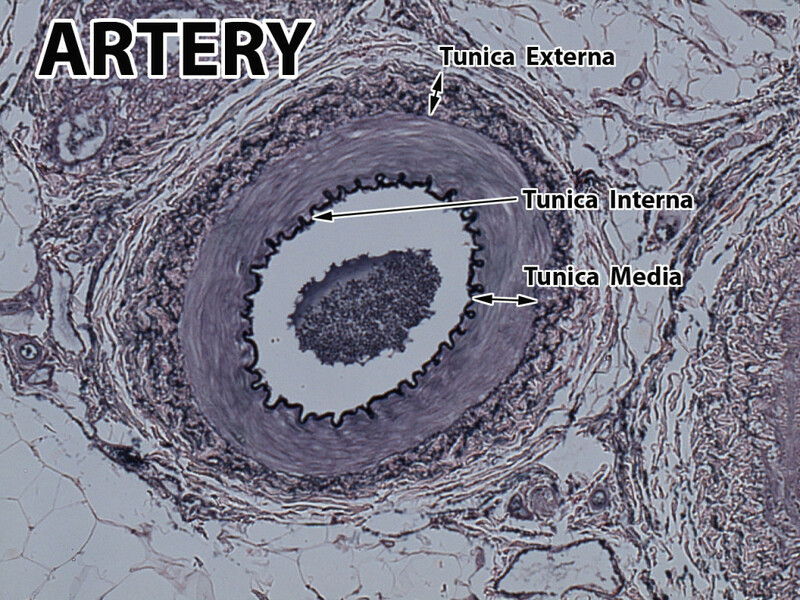 Tunica intima: a smooth endometrial layer. 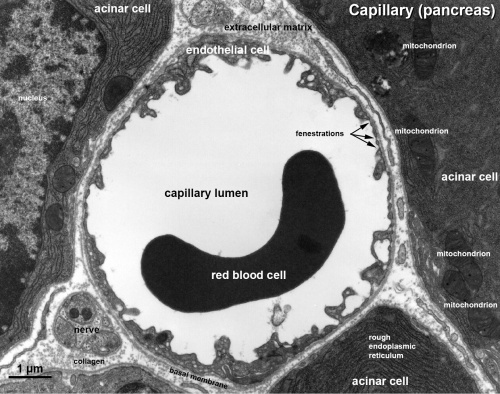 Capillaries are narrow vessels with permeable walls that occur in tissues. Capillaries allow the exchange of materials between cells in the tissue and blood in the capillary, through the leaking of tissue fluid. Only one cell thick, only an endothelium coated by a filter like protein gel. Pores exist between the cells, which allow plasma to leak out, forming tissue fluid. Tissue fluid contains oxygen, glucose and all other substances in blood plasma apart from large protein molecules, which cannot pass through the capillary wall. follow instructions for the lab given in class. key questions: Why does the heart have four chambers? Why does the heart make noises? Understanding how the heart works can help you save a life. Why does this work – hands only CPR? The heart works like a pump, maintaining the flow of blood in the double circulatory system using physical pressure. This physical pressure comes from the contraction of the cardiac muscle in the wall of the heart, which literally squeezes the blood out of the heart and into the arteries. If the heart is not beating, manual compression of the sternum, or breastbone, can cause the heart to become squeezed by the pressure of the sternum pushing down on the thoracic cavity. This will mimic the contraction of the heart, and squeeze blood into the arteries. The heart is divided into four chambers, and into two halves. There are two chambers on each side of the heart. The upper chambers are the left and right atria, and the lower chambers are the left and right ventricles. This is a division of labour; Right side pumps to pulmonary circulation, and Left side: pumps to systematic circulation. Each side of the heart has a major artery, and a major vein to take away and receive blood. On the left side; the aorta and the pulmonary vein. On the right side: the pulmonary artery and the vena cava. The heart also has valves, to prevent back flow of blood. There are valves in between the upper and lower chambers (atrio-ventricular valves), and in the aorta and pulmonary arteries (semi-lunar valves). The coronary artery supplies the heart muscle (cardiac muscle) with oxygenated blood. It branches from the aorta at the point where it leaves the left ventricle. Q) What is the essential difference between the blood in the left and the right hand sides of the heart? Q) Which part of the heart receives blood from the body / from the lungs? Q) Which part of the heart pumps blood to the lungs / to the body? Q) When do the heart sounds happen? The muscle which forms the lining of the heart is called cardiac muscle. Cardiac muscle is myogenic, or self-stimulating, in that it can contract without stimulation from motor neurones. 1) Atrial systole. This is when the right and left atria contract, forcing blood into the lower chambers of the heart, through the open atrioventricular valves. This is brought about by a group of specialised muscle cells on the wall of the right atrium called the sinoatrial node, or pacemaker. The pacemaker generates a wave of depolarization ( a nerve impulse), which spreads throughout the walls of the atria and stimulates them to contract. 3) Diastole. This consists of the relaxation of both the lining of the atria, and the lining of the ventricles. This causes blood to enter the atria, from the veins. 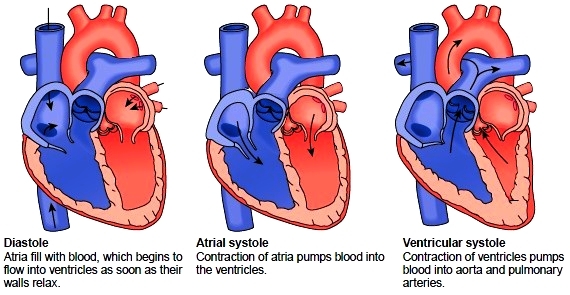 The blood actually begins to fill the ventricles, passing through the AV valves when the pressure in the atria rises above that of the pressure in the ventricles. 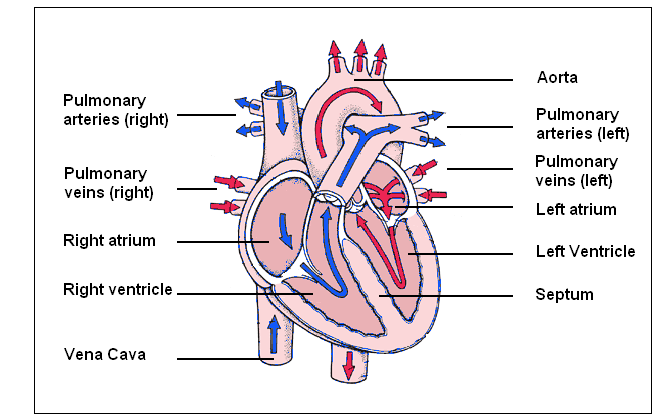 TaskA: Make a table summarising blood flow from, blood flow to, semi-lunar valves (closed-open),and av valves (closed-open), for the three stages of the cardiac cycle. The role of epinephrine – The hormone adrenaline, or epinephrine, is released into the blood in extreme situations. The adrenal glands are in the kidneys, but the secretion of epinephrine is ultimately controlled by the brain. Known as the ‘fight or flight’ hormone, this may influence the sinatorial node causing the rate of heart contractions to increase. The role of the brain: The hypothalamus is a region of the brain that detects the acidity of the blood, based on the amount of carbon dioxide dissolved in it. Intense exercise causes a rise in CO2, causing acidosis (or acidification of the blood). The cardiovascular centre in the medulla oblongata, sends a signal to the pacemaker to speed up heart rate. One deals with speeding up the heart rate (low blood pressure, low pH, low oxygen concentration). The other deals with slowing down heart rate (high blood pressure, high pH, high oxygen concentration). When the heart contracts, a wave of bio-electricity (an impulse) passes through the tissue of the cardiac muscle; causing it contract. The signal originates from the sino-atrial node “the pacemaker” (1), and then spreads through the atria causing atrial systole (2). 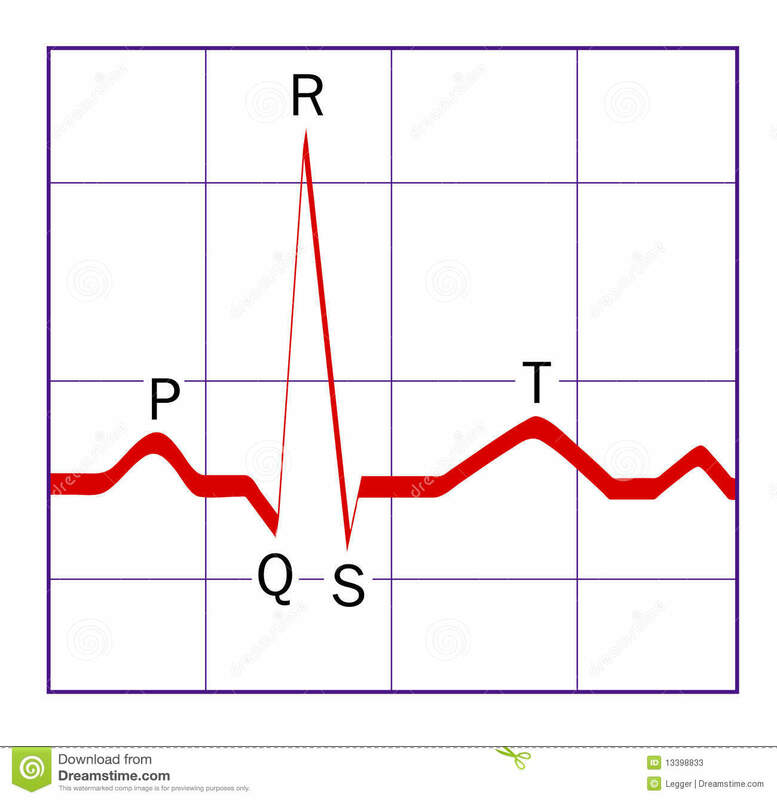 It is important that the ventricle walls contract from the apex upwards, and so the signal passes down through the septum (3) before spreading up through the walls of the ventricles causing ventricular systole (4). 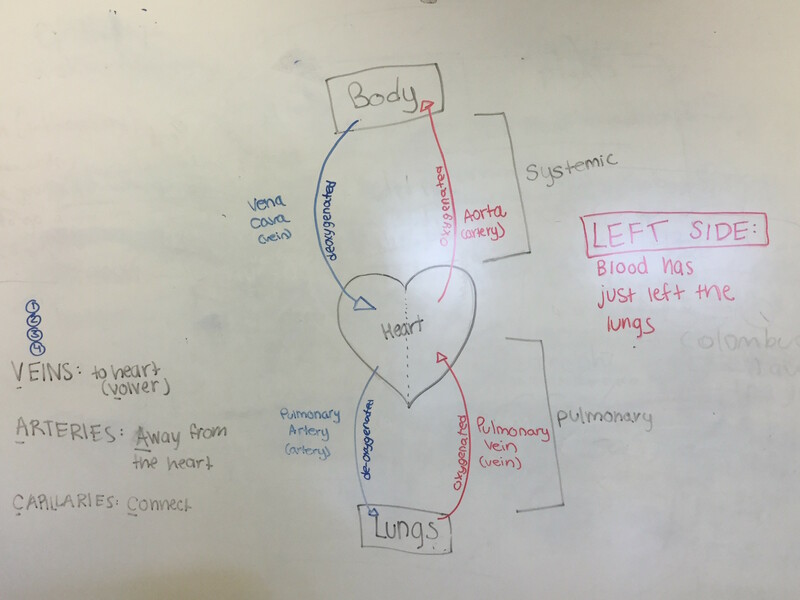 Revise the heart cycle with IB Bio students!